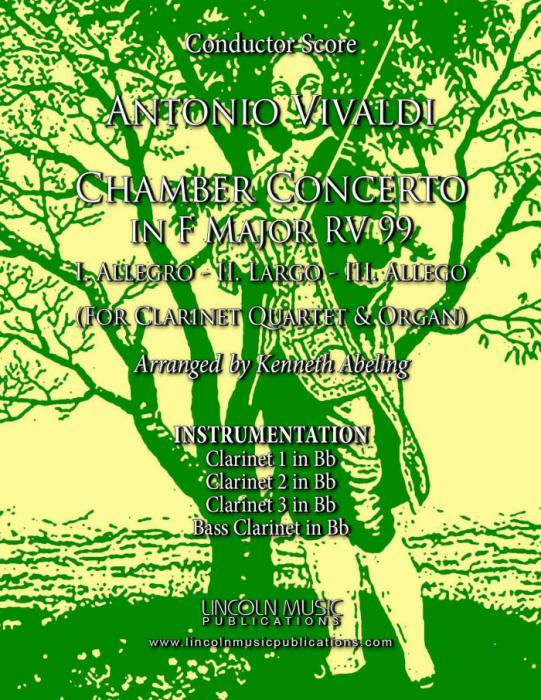 Antonio Vivaldi’s Chamber Concerto in D Major RV 99. Originally written for Recorder, Violin, Oboe, Bassoon and Harpsichord, this arrangement is for Clarinet Quartet with an optional Organ part by Kenneth Abeling. The movements are: I. Allegro - II. Largo - III. Allegro. This is an advanced piece and suitable for both general performance. in its entirety or in parts, and for secular as well as sacred settings. Playing Time approximately 9:50.